In the app marketplace, it’s a fact that Apple is out in front, mainly thanks to its huge iTunes website. There is literally an endless amount of iPhone apps, including fine serious iPhone photography apps, which we spotlighted not too long ago. However, as far as Android, Google’s smartphone operating system, is concerned, it is catching up faster and faster all the time. Whereas Apple has its iTunes store, Android has answered in kind with the Google Play store, where you can download almost any Android app under the sun, including a nice selection of serious photography apps! The Google Nexus line of smartphones features pretty sophisticated cameras that can easily give Apple’s iPhone cameras a run for their money. Thanks to ever-improving smartphone technology, you don’t really need to go out and purchase a fancy digital camera anymore if you want to take great pictures of virtually anything. 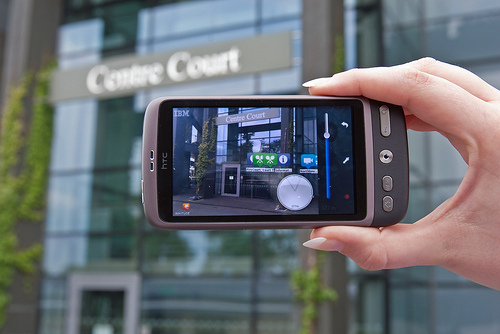 Your Android smartphone with its surprisingly sharp camera can take shots that rival any decent digital camera. When you add the tools of Android photography apps, then the sky’s almost the limit. 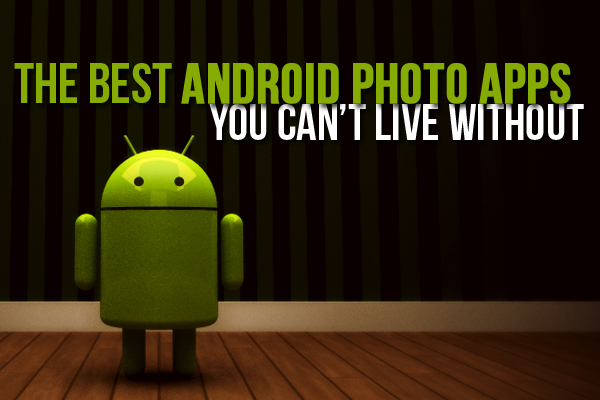 Sit back and take in the best Android photo apps ever. The most popular photography app on Earth thanks to the more than 100,000 users across the planet, Camera360 Ultimate is actually a suite of easy-to-use though enjoyable photography tools. It includes Pink360, Movie360 and HelloCamera. 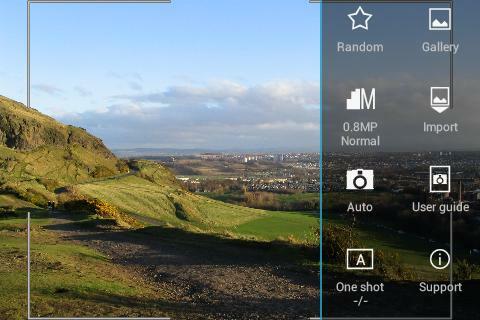 If you’re a fan of exploring various shooting modes, then Camera360 Ultimate is right up your alley. 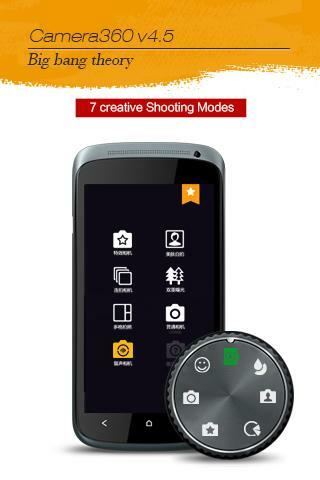 It features six shooting modes: the color-shift mode, the tilt-shift mode, the funny mode, the quick-shoot mode, the self-portraitmode and the special effect mode. The special effects tools have been given an upgrade so that you’ll be able to generate more color and greater clarity to shots. Of course, no app these days is complete without the all-important social-media sharing options. Camera360 Ultimate allows you to share your best pictures with everyone on Twitter and Facebook. It currently enjoys a 4.3 out of 5 rating on the Google Play store from more than 170,000 votes. Adobe brings its highly respected and esteemed photo-editing software to the Android smartphone, but is it a winner? It certainly is if you value being able to do virtually anything you want to your pictures in order to spruce them up like never before. Adobe Photoshop Express permits users to play around with their pictures in ways both new and old. Sure, you can manipulate your pictures how you’ve always done, by rotating, cropping and adjusting colors until you obtain just the right combination. However, you can also add unique artistic effects to your images, letting you play around with the whole editing process very creatively. Edit away until you get the right combination of colors you want! Beware, though! You’ll need an SD card to make any headway with this app. In spite of this requirement, the app is quite highly rated on the Google Play store: Out of almost 90,000 votes, it garners a 4 out of 5 rating. 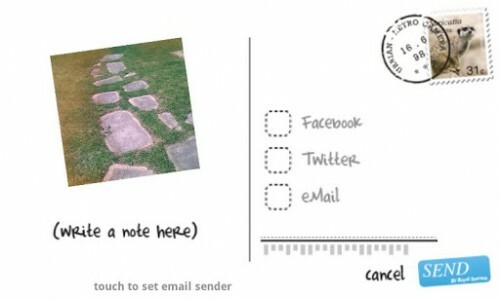 PicSay’s app concept is extremely straightforward: You can add words and messages to your pictures, turning them almost into veritable, virtual postcards, but that’s not all. The ingenious approach of this Android app lies in the fact that it’s also a remarkable picture editor. 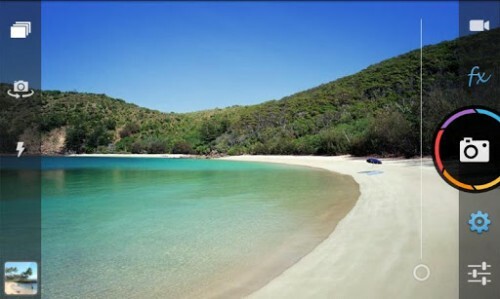 For example, you can color-correct your images, just as you can add effects like distortion. The Eiffel Tower–after some nifty editing. If you want to add word balloons to your images, go right ahead! If that’s not enough for you, then incorporate titles and even various graphics to really add personality and flair to even the most boring or ordinary photographs. 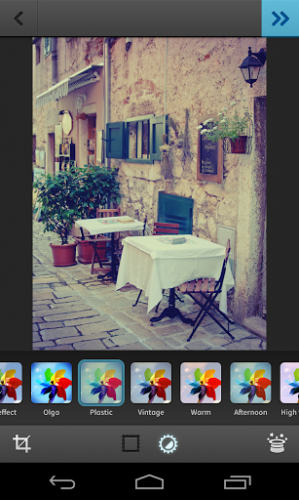 An award-winning photography app, PicSay isn’t just enjoyable, but it also features a user-friendly interface. For all of this, it deserves its notable 4.5 out 5 rating on the Google Play store, out of almost 100,000 votes. Vignette may just be the ultimate serious photography app on your Android smartphone, mainly because you can do so much with it. To wit, you have an almost endless choice of different photo effects that you can produce thanks to this app. It features 50 frames and 70 customizable filters in any combination under the sun to play with—you can really let your creativity take over as you create amazing photo effects. 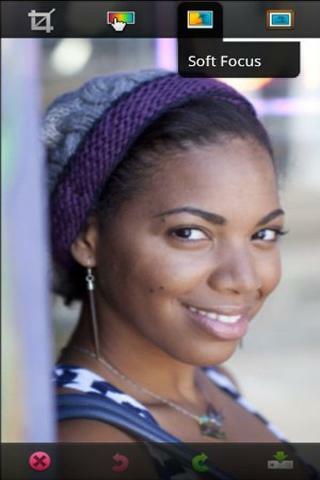 Improve your photo how you want! In addition to these nifty photo effects that you can incorporate into your photos, the app also works as a complete camera application. Some of the many fine things it offers are a self-timer, time-lapse and even digital zoom. It’s highly rated on the Google Play store: Out of almost 10,000 votes, it’s earned a 4.4 out 5 rating! This app has actually won awards, which puts it in a league of its own. It’s also been highly reviewed at various websites such as Mashable, Lifehacker, Gizmondo and SlashGear. This app gives you a powerful digital and optical zoom feature of 6x. Speed lovers will also get a kick out of the fact that it features up to 10 shots a second, making it the fastest camera app on Android right now! Not only can you customize all of your hardware buttons (like the volume buttons for controlling zoom), but you also get settings for exposure, brightness, focus metering, ISO, sharpness, saturation and contrast. Fool around with exposure, sharpness, ISO and more. You can also do a lot with post processing, the import of existing pictures and multiple shooting modes. No wonder it’s an award-winning app! This is not a free app, however, but with all that it can do, you can easily justify the cost. Out of more than 50,000 votes on the Google Play store, it currently has a 4.4 out of 5 rating. Creative, easy and free are choice words to describe the Fx Camera app, and with good reason. It features more than 30 filters from which to choose, making it hard for you to pick which image will become your favorite! Share your wonderfully edited shots with the whole world as well by using both Twitter and Facebook. Fx Camera provides more than 30 unique filters that will occupy your time for quite a while. Use Toycam to make your images more vibrant than ever, or rely on Instant to, as the name implies, take instant-looking pictures. What do you want to do with your images? FxCamera puts you in charge. Play around with your pictures and create something truly special. Crop rectangular and enlarge your shots, or just take advantage of all the background colors and custom-designed filters. The consensus for Fx Camera on the Google Play store is stellar: Out of almost 150,000 votes, it has achieved a 4.3 out of 5 rating! With a name like Retro Camera, you know this app will take you back in time to some very groovy, classic memories of how pictures used to look…before the advent of all this crazy technology we have today. Retro Camera is a straightforward app to transform your modern images into old-school treats that will impress everyone you show them to. Include a retro twist in your images and then share them! Want to try your hand at vignettes? No problem! This app features 5 different sets of vintage vignetting, black-and-white effects, cross processing effects, film scratch and 5 cameras from which to choose. Everything you’ll do with this app was inspired by brands such as Polaroid, Holga, Lomo, Diana, Hipstamatic and even toy cameras! Google Play store customers are ecstatic about it. Out of more than 53,000 votes, it’s garnered a 4.3 out of 5 rating. 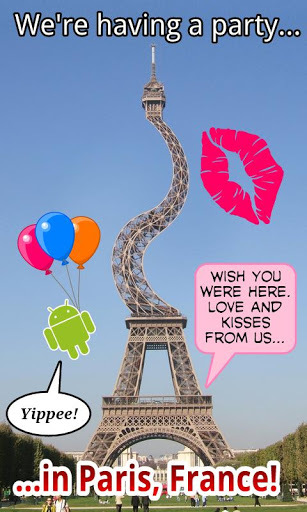 This Android photography app is for the lovers among us. The point of the app is to let you create a highly personalized framed image that you can save in your album for all time. Simply pick a photo from the pre-existing gallery or take a whole new image camera. Then, just pick a frame and—presto! You’ve got your love photo frame. 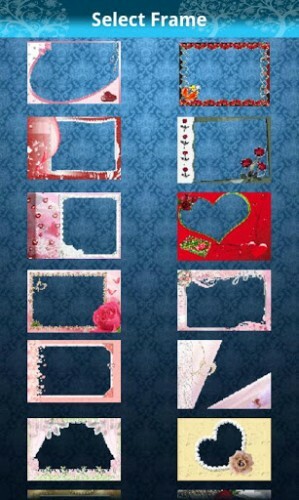 You get a large selection of love frames from which to choose. Not only is this easy to use and great for lovers, but it has neat features that you may not even expect. For example, there are more than 60 HD frames at your disposal, while you can also add various color effects to your images. 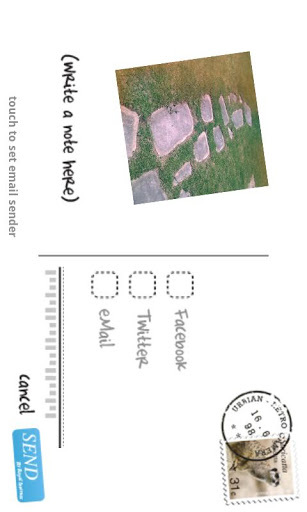 Finally, share your images on Twitter, SMS, Facebook and email! People have…fallen in love with Love Photo Frames. Out of almost 12,000 votes, it has a 4.5 out of 5 rating on the Google Play store. Android smartphones have gotten increasingly sophisticated over the years. These days, your smartphone can take some impressively sharp pictures that the average person won’t even be able to tell came from a mere phone! Sure, the quality of your Android smartphone pictures won’t come close to a pricey digital camera, but with the above apps, it doesn’t matter! Want some additional shooting modes for your camera? Then pick up Camera360 Ultimate. Interested instead in editing your pictures to your heart’s content? Then give Camera Zoom FX a try! If your ambitions lie in adding nifty effects to your camera that feature a vintage touch, then download Retro Camera. The possibilities for Android photography are endless. Do you have your own favorite Android photography apps? Have you already tried some of the interesting apps on this list? Feel free to tell us about your experiences in the comments section! And, as always, share this post with your friends and family!